ARThound is now all-electric with the Nissan Leaf and it feels great. 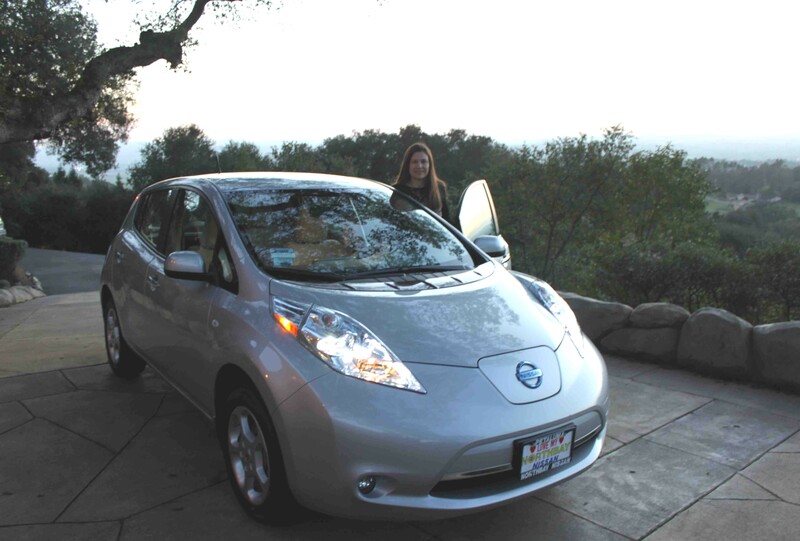 We were the first customers to receive the Leaf in Sonoma County through Northbay Nissan in Petaluma. After what seems like forever, our long-awaited all electric Nissan Leaf has arrived and it’s impossible to write objectively about how good it feels to be off oil and to be the first customers in Sonoma County to actually receive their Leaf. The Leaf is part of our strategy, several years in the making, to go renewable through solar and to dramatically reduce our carbon footprint. Like many who live in Northern, CA, we feel our area is ripe for EV adoption and are proud that we will help lead the revolution. Actually, we were one of those 16,300 early enthusiasts who reserved a Leaf last summer in anticipation of its December 2010 launch–delayed several times. The first Leaf actually did arrive at Petaluma’s Northbay Nissan in December but left immediately with its new owner in Silicon Valley. So, when we got the call last Thursday, that we would be the first in Sonoma County to take delivery of our Leaf, we could hardly believe it. The Nissan Leaf is a zero emission vehicle with a caveat—the car itself is zero emission when charged from solar PV systems but when charged from PG&E’s electrical power (the major supplier here in Northern, CA), it’s slightly better than a Toyota Prius (the leading hybrid) in terms of its overall (car plus electrical generation) emissions. Our Nissan Leaf SL is zero emission because we are charging it from the sun. Commercial all electric vehicles (EVs) have been around for over 10 years now, but they always seemed to suffer from being impractical, weird, expensive, or downright ugly. General Motors EV1 elevated our consciousness but was killed by Big Oil. Chris Paine’s marvelous movie “Who Killed the Electric Car” tells the story unflinchingly. 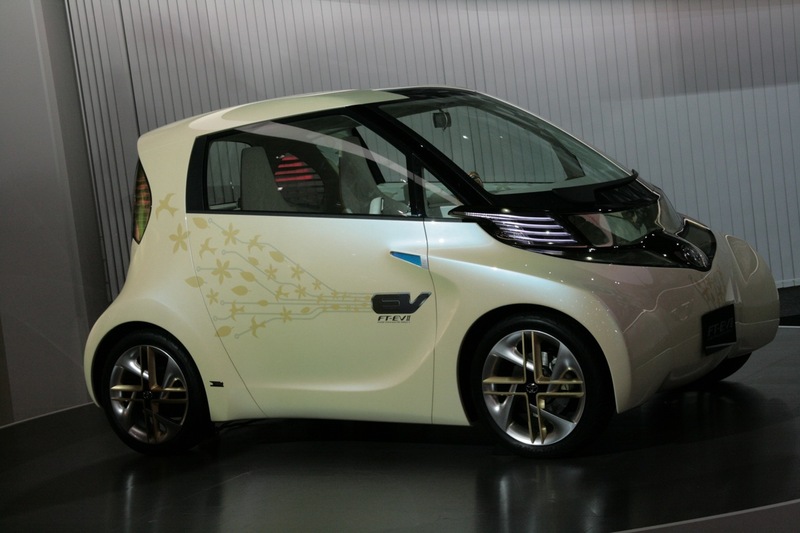 Other EVs soon followed suit but were fatally weird or downright goofy looking–the Mitsubishi iMiEV, BMW’s Mini E, Nissan’s EV-02, Toyota’s FT-EV II, to name a few. The stunning Tesla Roadster broke onto the scene in 2008 as the first truly commercial EV but was affordable only by the wealthy starting with an MSRP over $100,000 for a two seat sports car. When President Obama entered office, he appointed Steven Chu as Energy Secretary. Both Obama and Chu are ardent believers in the dangers of climate change and the economic crisis that U.S. and global addiction to oil will eventually trigger. They created an extremely favorable environment for the electric car and directed the Department of Energy to make it happen. When Nissan received a $1.4 billion loan to build a plant in Tennessee to manufacture the Leaf, the first very affordable and attractive commercial EV was on its way. The Leaf and other reliable and affordable EV’s are essential in the fight against global warming which will drive catastrophic climate change over the next 50-100 years. Simply stated, global warming is driven primarily by the CO2 Green House Gas that is released by our burning of fossil fuels, like gasoline. Automobiles and other motor vehicles are the largest offenders in releasing CO2 into the atmosphere. NASA scientist Dr. Jim Hansen’s well-known oft-quoted publications on the implications of climate change are harrowing. EV’s are crucial to the plan for eliminating our CO2 emissions because fossil fuel burning transportation is the largest contributor to these emissions. Generating electricity from renewable sources such as solar, wind, biomass, geothermal, tidal and hydroelectric combined with zero emission EV’s can eliminate the automobile’s contribution in a straightforward manner. This formula also eliminates our addiction to oil for our automobiles thereby reducing the economic risk of oil’s price or availability. The US economy and national security are at severe risk due to our addiction to foreign oil. The US does not have enough oil reserves to make a difference should supply be jeopardized. The planet itself is approaching “peak oil,” where Earth’s maximum reserves and production of oil hit an upper limit, or peak, and then begin declining. Just as demand for oil is starting to accelerate rapidly in China, India and the developing world, oil’s availability is about to peak and then will decline. If we, as a planet, don’t reduce our consumption of oil, the CO2 emitted from automobiles burning gasoline will accelerate global warming. Eventually, we will see an economic crisis making the 1974 oil embargo look like peanuts and from that all sorts of disasters will follow suit as oil is so integral and deeply woven into the fabric of our economy. In addition to purchasing a Nissan Leaf, two years ago we designed and built a 12.6 kWatt solar PV system that creates all our electricity from sunlight. This is bringing our home to nearly CO2 neutral. Our electricity will be free when our system finishes paying for itself in 1 ½ years from saved utility bills and we have created a model we are proud of— getting off of fossil fuel generated electricity. If everyone could buy and install an EV and a solar PV system, our planet would be safe from the unthinkable impacts of global warming on climate Change and the coming economic crisis due to peaking oil supplies. That’s the back story to our Leaf purchase. After paying $99 and signing up for the Leaf months ago online, and waiting through numerous delays, we took delivery last Thursday from Petaluma’s Northbay Nissan. Besides loving the car, I couldn’t believe it cost just over $20,000 after incentives, which is a ridiculously low price for a new car of any quality. With an MSRP at $32,780, California will give you a $5000 rebate check immediately and the IRS will give you a $7500 tax credit next April 15, leaving the final price at $20,280, plus tax and license. A deal! You can visit the Leaf site to appreciate what they offer. We bought ours from Ron Coury at North Bay Nissan in Petaluma which has become the Leaf sales leader and popular with customers from all over CA due to its extremely competitive pricing. Upon first glance, the Leaf appears quite small. When I jumped inside, I was shocked at how roomy it is and at its sophisticated dashboard and front-end technology. Both the front and rear seats are comfortable for me at 5’10” with long legs (36’ inseam), as well as offering overall reasonable visibility. The front and rear doors make it easy to enter and the hatchback makes this little car seem almost like a mini-SUV. The rear seats fold forward and an optional rear cargo compartment cover ($190.00) creates a nearly flat storage area from the front seats to the hatch door, just perfect for a giant red hound. Of course, the fabric seats available only in a dove gray color will be a HUGE problem for pet owners as these just grab hair right off the animal. Leather please! We paid an additional $900 to have the car perma-plated and Scotchgarded but it’s not going to solve this issue. I was also hoping that once the seats folded down, there would be a standard protective mat to place over the area if you want to transport a bicycle and keep that upholstery clean. Not yet. Mastering the procedure for starting this electric car without an actual key takes a few practice runs. First, you put your foot on the brake and then push the start button, release the emergency brake and put it in drive. It’s dead quiet, so you really have to take it on faith that it’s ready to go. It feels incredibly quick from a standing start due to the torque character of the electric motor. Its handling is quick and responsive and it turns and stops on a dime, almost feeling like a sports car. I timed it yesterday when merging onto Highway 101 South and reached 65 mph in a snap, a lot faster in fact than I do in my 2009 Subaru Forester. It’s a truly fun little car to drive and feels quite different from a Toyota Prius or other gasoline-powered car. My only complaint is that shifting into drive is done by pulling back on the shifter and reverse is forward, not terribly intuitive for someone who previously owned a jeep and has become accustomed to shifting Tom’s Z06. Note to Nissan: Forward = drive. Reverse = reverse! Speaking of its quiet ride, it’s so quiet that Nissan added sound back in to alert the sight and otherwise impaired. Nissan fitted a small speaker on the car’s left front that emits a very subtle tone up to 18 mph. After that, Nissan reasons that sound of the tires and wind will be sufficient to warm of an approaching Leaf. When it’s in reverse, it also emits a faint sound. The Leaf comes with an innovative EV-IT system that assists with range tracking and updates about nearby charging stations. Down-side: Big Brother is a co-passenger and he's very talkative. For a relatively inexpensive car, it’s rather sophisticated. The LED headlamps, EV-IT and navigation systems, Nissan Carwings economy tracking system, solar panel (only available with SL model), built in Bluetooth speaker phone, are all features one might find on a more expensive car. Driving the car is really about optimizing your range. The car comes with a number of features that assist with that. 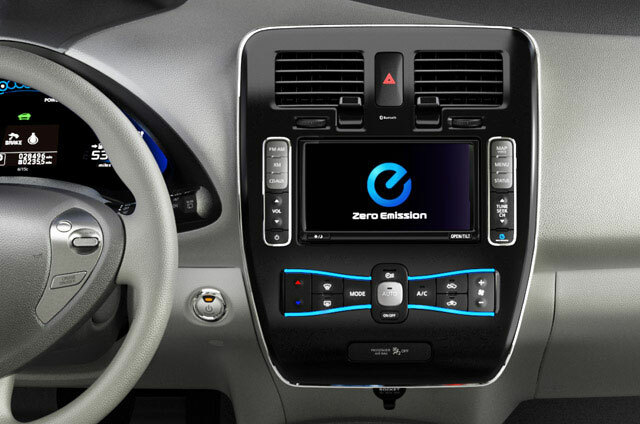 Constantly displayed are how much charge is left and how many miles remain in your driving range. A power meter tracks energy consumption and regeneration. If you drive efficiently, the eco indicator will reward you with a virtual forest. You can also check with the trip computer to see how much time is needed for a full charge. You can switch settings to see your efficiency in miles/kWh. 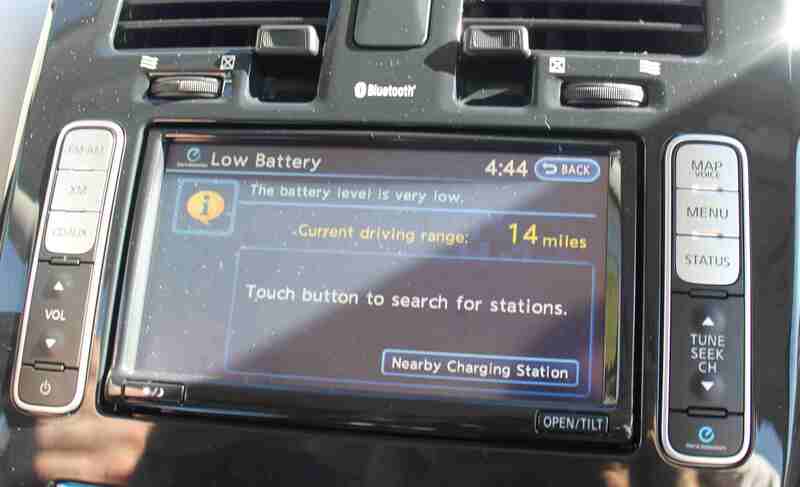 At roughly 20 remaining miles, the Nissan Leaf alerts you of your status and offers to assist you with finding a charging station. There’s also an EV-IT system which gives you pertinent graphic information. On the map display, you can see your remaining range with a circle giving nearby charging spots. Another screen tells how to maximize your heater or A/C usage to maximize range. I had worried that I would have a lead foot and would not be able to maximize the efficiency of the battery charge. The Leaf has what Nissan calls the ECO mode where the car’s computer takes control of acceleration and tries to optimize the battery charge. This really works and it is barely noticeable that computer is controlling acceleration. Two complaints so far– the multi-level touch screen controls are complex and hard to manage while driving and using the windshield wipers, heater and air conditioning does significantly reduce mileage. Don’t try to get the full 100+ miles if it’s a cold rainy day and you need to run the heater, defroster and windshield wipers throughout the trip or a hot day and need air conditioning. I would guess it takes about 20% of the battery charge to continually run them. For running around town, the Leaf is fabulous and economical. We have our own solar PV system so charging the Leaf is free. It feels great driving by all those gas stations with their $4 plus per gallon for regular signs staring you in the face. Tom charges the Leaf with a unit that looks just like a gas pump. 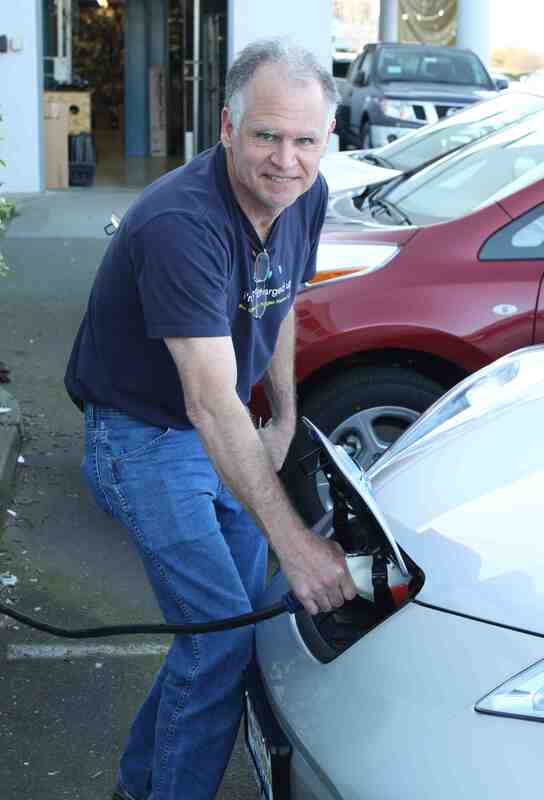 Our Leaf came with a 120 Volt Level 1 EVSE that allows charging from a standard 20 Amp outlets available anywhere. Everyone had been concerned at how slow charging would be at 120 Volts and how the 240 Volt EVSE was going to be over $2000 installed. We discovered that since we don’t run the battery down too low, that at 120 Volts, the Leaf charged to 100% easily overnight in about 12 hours. We have been plugging it in around dinner time and by morning, it’s fully charged. We have ordered a 240V Level 2 Charging EVSE and will be installing it in our garage ourselves with the help of an electrician friend. By doing this, we will be able to install the Level 2 EVSE for about $900 in our garage. Once we’ve done that, we will be able to charge our Leaf in about 5-6 hours from empty to full. The Leaf is fitted with a 24kW lithium-ion battery pack complete with 48 separate modules housing four cells a piece. If one of these fails, Nissan can replace the nodule without having to replace the entire battery pack. That’s on Nissan. If you happen to ignore the numerous built-in warning systems, and deplete your battery, the first Leafs come with 3 years of free roadside assistance. A flatbed truck will haul you to a charger. I have yet to drive the car into San Francisco and park in any of the numerous garages with charging stations. I mainly park at Sutter/Stockton Garage, Civic Center, and Opera Plaza and all of these supposedly have stations. EVs can drive in the commute lane by applying for a special sticker…worth the price alone.